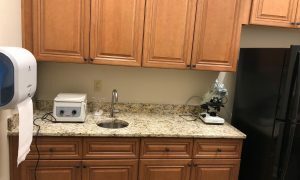 We perform general labs: swabs for strep throat and flu, electrolytes, liver and renal function tests, lipid profiles, glucose levels, urinalysis and KOH and wet preps with microscopy. The results of above tests are available at the time of your visit. Blood count and other tests will be sent to outside labs with variable time availability.